Truck equipped with a dump body; it is used for bulk transport. Compartment from which the driver operates the truck. Open or closed container; when raised by the elevation cylinder, it discharges its bulk material. Device composed of treads and side rails that provides access to the cab. 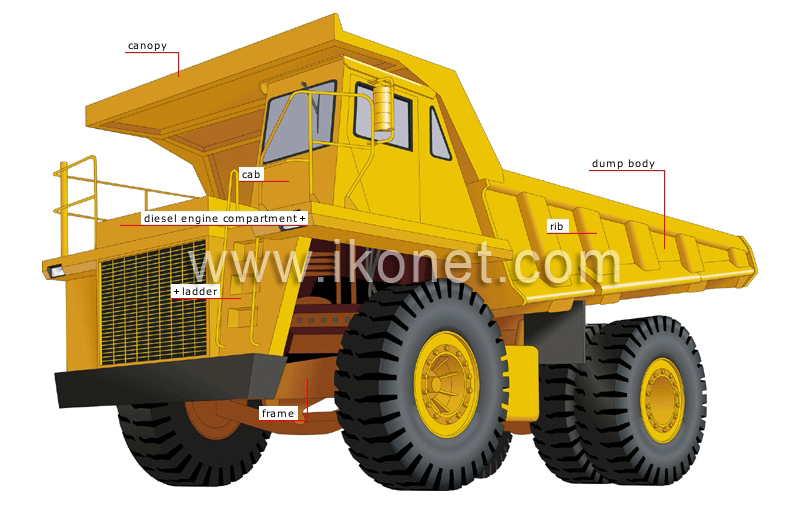 Metal structure of the dump truck. Crosspiece welded to the outside walls of the dump body to reinforce it. Combustion engine in which the compressed air becomes sufficiently hot to ignite the injected fuel. Metal surface that protects the cab from falling material during loading.